We’d love your help. Let us know what’s wrong with this preview of Piper Green and the Fairy Tree by Ellen Potter. From award-winning author Ellen Potter comes a charming new chapter book series where kids, lobster boats, and a hint of magic are part of everyday life. Li From award-winning author Ellen Potter comes a charming new chapter book series where kids, lobster boats, and a hint of magic are part of everyday life. To ask other readers questions about Piper Green and the Fairy Tree, please sign up. Does piper bring the kittens home? This answer contains spoilers… (view spoiler)[Piper brought the kittens home, and her aunt came an gave them kitty supplies. Well this was a pretty decent start, though I have to say it was a bit too short for my liking. This felt more like one chapter of a story instead of the first book in a series. Also, I may be the only one, but I thought Erik was dead. With how everyone talked about him, especially Piper, I thought something terrible had happened, but instead Erik just had to move so he could go to high school. I quite liked Piper, but at times I just found her rude and a bit too weird. Especially towards adults. Well this was a pretty decent start, though I have to say it was a bit too short for my liking. This felt more like one chapter of a story instead of the first book in a series. I quite liked Piper, but at times I just found her rude and a bit too weird. Especially towards adults. Yes, I get you miss your brother, I get that you want to keep those earmuffs on, but really, no is no. It just that easy. I quite like the world building in this one. The islands seem like a fun, peaceful place to live. I also like the name of the islands (Peek-a-Boo). There are also illustrations throughout the book and I am glad to see they are all just as fun as the cover illustration is. Piper looks a bit like Judy Moody (just younger). There were several really good, laugh out loud moments. I'm excited to welcome Piper Green into my students' lives. I first became aware of this book's author, Ellen Potter, a few years ago when I read her book "The Kneebone Boy". I was very much taken by that book. The narrator, one of three siblings, was charming, observant, generous and amusing. There was an awful lot of deadpan humor, and it was one of the few middle grade books I've read that could be described as "droll. Moreover, it was remarkably refreshing to have siblings who worked as a team, who forgave each other, and who rooted for each other. All of that is the long way of getting around to my keen interest in this book. It is aimed at younger readers, but has a similar structure. I wondered - could the author catch lightning in a bottle a second time? For much younger readers? The answer here is "Yes". Our heroine narrator is Piper Green, rising second grader. She lives with Mom and Dad and a younger brother in a tiny island fishing community off the coast of Maine, and she commutes to school, with a few other kids, on a lobster boat. The plot of this short book revolves around the fact that Piper misses her older brother, who has moved on to a mainland boarding high school, and stubbornly refuses to take off the silly earmuffs he gave her as a momento when he headed off-island. That might sound a bit slim, but we manage to touch on Piper's sadness, the opening of her first second grade school days, the consequences of her stubbornness, the challenge of change and growth, the kindness of neighbors, the gentle firmness of her parents, and the overall complexity of the world when seen through Piper's eyes. She is stubborn, and a bit outspoken, has a temper and can be moody. But none of this is cutesy, excessive or added just for lazy effect. Piper seems authentic and real; she is crafted with just enough exaggeration and license to make her interesting and appealing as a character. Nothing is taken too far and the resolution of the various small dramas is satisfying and upbeat. (For what it's worth, the magical fairy tree angle is fanciful and imaginary; this is not a fairy/magic/little-witch book). As you would expect, the book is technically well crafted. Vocabulary, grammar, syntax and the like are all correct and appropriate. There is a hint of puckish good humor in some of the dialogue, and in the sly and dead-on descriptions of some of the characters. Overall the book is fresh and the heroine engaging and bright. The story-telling is fast paced. The upshot is that this strikes me as wonderful offering for a young reader who is moving beyond chapter books and is looking for interesting characters and settings, a bit of drama, and an overall flavor of generous good humor. What an excellent series for younger readers! The plot kept my daughter and I guessing, the story is realistic with a hint of fantasy, and the precocious main character (Piper) deals with real emotional issues. I wish all early reader series had this much respect for the abilities of younger readers to understand more complex texts. Plus, living on an island and having to take a lobster boat to school sounds fun. SO excited about this new series from author, Ellen Potter! Piper is a character that readers will find engaging and the story line is easy to follow, but not over simplistic. I''m looking forward to more installments! If you lived on Peek-a-Boo Island just off the coast of Maine, you would have to take a lobster boat to and from school every day until it was time to go to high school. Then you would have to leave the island and go to boarding school on the mainland. Now it's the first day of school, and second grader Piper is missing her older brother Erik, who has just started boarding school. To feel closer to him, Piper decides to wear his old monkey earmuffs 24/7, even in school. New teacher Ms. Arabella m If you lived on Peek-a-Boo Island just off the coast of Maine, you would have to take a lobster boat to and from school every day until it was time to go to high school. Then you would have to leave the island and go to boarding school on the mainland. New teacher Ms. Arabella may look like a princess to her students, but, unfortunately for Piper, she has some very definite idea about where her students will sit in class and what they may or may not wear in school, and that includes monkey earmuffs. But when Piper refuses to take them off, she must stay in at recess and discovers when she get home, that a phone call to her parents has been made. And even though they tell her no earmuffs in school, Piper is determined to keep them on and Erik close. The next morning on her way to the lobster boat, Piper decides she done with second grade. She decides to hide in a tree, and sitting on a branch, she watches as the lobster boat heads to school. But when things quiet done, Piper hears an odd sound - like the tree is crying. 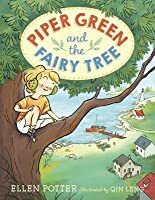 While Piper is sitting in the tree, hearing it cry, along come neighbor Mrs. Pennypocket, who immediately knew what to do when she heard the tree crying - and it was just the solution to help Piper give up her earmuffs. As she saws off a small tree branch, Mrs. Pennypocket and Piper talk about how much Erik is missed and the reason for the earmuffs. But after the branch is off the tree, Piper finds two kittens, who had gotten stuck after the mother cat had hidden them in a hole in the tree. Mrs. Pennypocket tells Piper the tree is a fairy tree, one she has been searching for ever since her grandmother had told her about it. If you take a treasure from the tree, you must leave a treasure. Yup, that's right, Piper took two little kittens and left Erik's earmuffs, but not her feelings about missing him. 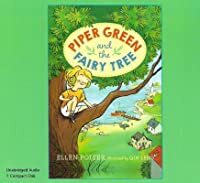 Piper Green and the Fairy Tree is a new early chapter book series with a sweet, spunky, but stubborn main character that young readers won't be able to resist and a setting that offers endless unique possibilities for more Piper Green stories. Though the idea of having a magic tree in one's front yard is a lot if fun, the real problem in this first book of the series is that Erik was away at boarding school and Piper is missing him more than the people around her realize. Until Mrs. Pennypocket talked to her about her feelings, no one asked why she was wearing Erik''s earmuffs, not even her teacher, who just punished Piper by taking away recess. Inked Black and white full page and spot illustrations by Qin Leng are scattered throughout the book adding a light, humorous touch to the story and serve as excellent visual cues to the action for young and beginning readers, like seeing Piper and her friend Jacob on the lobster boat instead of a school bus, but then seeing the familiar school yard and classroom. There just aren't enough good early chapter books for kids, but fans of such classics as Junie B. Jones, Judy Moody, Bink and Gollie, and Amber Brown are sure to add Piper Green to this list of favorites. Piper Green lives on a remote island off the coast of Maine. When her brother goes away to boarding school, all she has left of him are his earmuffs. She's determined to keep them on day and night, no matter what her parents, friends, and brand new teacher say. But when she discovers a magic tree that requires gifts in order to give favors of its own, she has a choice to make. This is a sweet start to a new series. The unusual setting is fascinating and very fun to talk about with my five-year-ol Piper Green lives on a remote island off the coast of Maine. When her brother goes away to boarding school, all she has left of him are his earmuffs. She's determined to keep them on day and night, no matter what her parents, friends, and brand new teacher say. But when she discovers a magic tree that requires gifts in order to give favors of its own, she has a choice to make. Piper Green is in 2nd grade, her younger brother Leo is married to a piece of paper named Michelle and has sticky-note kids, and her older brother Erik, now in high school, spends his week on the mainland to go to high school. They live on a small island off Camden, Maine, and dad is a lobster fisherman. The kids ride a lobster boat to a nearby island to school Piper has a mind of her own...and the story is sweet and quite delightful. Cute little early reader--target range is from 7 to 9 years old. Earlier would be even better, I think. Little Piper is a quirky kid surrounded by other quirky souls on an island in Maine--but kind souls, and it seems like a good place to grow up. Except that for high school, you have to go to the mainland at a boarding school. This is where her big brother Erik just went, and she misses him. But the townsfolk take care of her in sweet ways. Another great early chapter book that I will be adding to my class library. Looks like it will be a series. We need more of these early or transitional chapter books that are well written with interesting characters! Terrific for second or third grade independent readers. Quirky and cute. Really fun early chapter book! This review has been hidden because it contains spoilers. To view it, click here. This was a cute little easy reader. I would recommend this as a starter book for primary to grade 1. Piper Green lives on Peek-A-Boo Island in Maine. She takes a lobster boat to school everyday. Her brother, Erik, has recently left to go to the mainland, which makes Piper sad. So she wears her brothers earmuffs EVERYDAY. She names them Glunkey and Jibs After her new teacher , Ms Arabella, tells Piper to not wear her earmuffs, she decides that 2nd grade is NOT FUN! So on the next morning, Piper h This was a cute little easy reader. I would recommend this as a starter book for primary to grade 1. Piper Green lives on Peek-A-Boo Island in Maine. She takes a lobster boat to school everyday. Her brother, Erik, has recently left to go to the mainland, which makes Piper sad. So she wears her brothers earmuffs EVERYDAY. She names them Glunkey and Jibs After her new teacher , Ms Arabella, tells Piper to not wear her earmuffs, she decides that 2nd grade is NOT FUN! So on the next morning, Piper hides in the tree in her front yard. What comes next will surprise you.. The tree starts to cry!!!!!!!!!!!!!!! When an active old lady passes her by, she is given astounding news. 1, there are real live kittens in the tree. AAAANNNNNNNNNNNNDDDDDDDDDDDDD, the very tree she is siting on is a fairy tree. All she needs to do is put in something special, and she will get something special. So goodbye Glunkey and Jibs. The next day, she gets good and great news. Her aunt is there, and so is Erik! The reason is 4 stars is that my old mind cannot handle this big amount of happiness. I had been discussing J fiction with someone and they mentioned this book. Thought I would give it a try to see if I could suggest to some of our little patrons. Piper Green lives on an island and has to take a lobster boat to school. Missing her older brother who is now in high school and has to live on the mainland she starts second grade herself. She thought she was ready until a new teacher is introduced and things are definitely not how they should be. Deciding to skip school on the second d I had been discussing J fiction with someone and they mentioned this book. Thought I would give it a try to see if I could suggest to some of our little patrons. Piper Green lives on an island and has to take a lobster boat to school. Missing her older brother who is now in high school and has to live on the mainland she starts second grade herself. She thought she was ready until a new teacher is introduced and things are definitely not how they should be. Deciding to skip school on the second day she discovers a secret fairy tree and the series begins. Piper Green is a second grader who lives on tiny Peek-a-Boo Island. Because there are only 8 kids who live on the island, she has to take a lobster boat to a small, mixed-grade school on the mainland. Her school year gets off to a rough start when her new teacher, Ms. Arabella demands that Piper remove her earmuffs. The earmuffs provide Piper with comfort because they remind her of her older brother, who recently moved to the mainland for school. Soon, Piper pretends to be sick to avoid school. Piper Green is a second grader who lives on tiny Peek-a-Boo Island. Because there are only 8 kids who live on the island, she has to take a lobster boat to a small, mixed-grade school on the mainland. Her school year gets off to a rough start when her new teacher, Ms. Arabella demands that Piper remove her earmuffs. The earmuffs provide Piper with comfort because they remind her of her older brother, who recently moved to the mainland for school. Soon, Piper pretends to be sick to avoid school. Piper climbs a tree to hide from her mom and soon notices the tree is making strange noises. When a neighbor named Mrs. Pennypocket walks by, she helps Piper discover something magical about the tree. This is the first in a series of Piper Green and the Fairy Tree short chapter books. It’s a fun story with a unique setting that will be a simple introduction to adventure stories for very young readers. 1. Piper Green rides a lobster boat to school every day. Compare and contrast how you get to school vs. how Piper gets to school. What would be different? What would be the same? Which would you prefer and why? 2. Imagine you had a fairy tree. What would you leave inside it? What would it leave for you? 3. Piper Green and the Fairy Tree is a series of books. Predict what you think will happen in the next book? 4. Mrs. Arabella has Piper’s classroom make a class dictionary of each person’s name, height and favorite things. Describe what your entry into the class dictionary would include? 5. Piper wears her older brother’s earmuffs for comfort. Describe things that remind you of your brother, sister or best friend, and why they remind you of them? Potter, E. (2015). Piper Green and the fairy tree. New York, NY: Alfred A. Knopf. This was an extremely quick read and would be a good first chapter book for kids who struggle with reading stamina. The setting provided an interesting detail--who wouldn't like to go to school everyday on a boat that has bakery donuts? The extreme quick nature of this book meant that little happens in the way of plot. However, I'm glad to see a book that will likely appeal to girl reluctant readers. Some of the dialogue is extremely odd---while my own children provide a fair bit of their own no This was an extremely quick read and would be a good first chapter book for kids who struggle with reading stamina. Piper is missing her big brother, who has started high school and, therefore, must live on the mainland. In addition, on her first day of 2nd grade, she finds out that she has a new teacher, Ms. Arabella. And she won't be able to sit next to her best friend, Ruby, but instead will have to sit next to Garth Shield. Yuk! But the final insult is that Ms. Arabella insists that Piper take off Erik's earmuffs that she has been wearing. That's where Piper draws the line ... and that's when her problems Piper is missing her big brother, who has started high school and, therefore, must live on the mainland. In addition, on her first day of 2nd grade, she finds out that she has a new teacher, Ms. Arabella. And she won't be able to sit next to her best friend, Ruby, but instead will have to sit next to Garth Shield. Yuk! But the final insult is that Ms. Arabella insists that Piper take off Erik's earmuffs that she has been wearing. That's where Piper draws the line ... and that's when her problems really begin. This review has been hidden because it contains spoilers. To view it, click here. Piper is a likable character and this series will be appealing to female beginning chapter book readers. The setting is interesting since it is far removed from what most readers are familiar. It took more than half the book to find out where her brother went and any mention of the fairy tree in the title. Girls interested in fairies, won't find them here. Maybe they will show up in future installments. I think that Piper Green is an awesome series with a girl that rides a lobster boat to school and loves adventure. She loves her family and has a fairy tree in her yard. It's an in-between level book that would be good for kids ages 5-9. The series gets even more fun with each new adventure. Piper makes funny decisions that sometimes lead to trouble, but it always works out in the end. It could also be a good read-aloud for younger kids. I loved this book. Piper has just enough spirit to make her cool and identifiable, but not so much that I find it unbelievable. She acted her age and I loved the setting. The structure of the story was fantastic - everything came together at the end. I will definitely recommend this series to second-grade girls. Talk about a character! This girl is a hoot - and I couldn’t get enough of her! “Piper, you are a most unusual child,” Dad said. “Yeah, well, Leo is the one who’s married to a piece of paper named Michelle,” I replied. Cute, heartwarming, and unique (the Maine setting is really neat!). I love this series. Review to come! A great replacement for Junie B. Jones. What a cute story! I think a lot of kids will really enjoy reading about Piper Green. Greatest book. I read it after my cute 8 year old did. She read it in 1 day and loved it and so did I. We will read more together. Cute chapter book for a second to fourth grader. Olivia Kidney was awarded Child magazine’s “Best Children’s Book Award” and was selected as one of the “Books of the Year” by Parenting magazine. SLOB is on more than 10 state book award lists and was selected for the Junior Library Guild. Spilling Ink; A Young Writer’s Handbook was a New York Public Library Top 100 Children’s Book for 2010 and a Children’s Literature Assembly 2011 Notable Book. Her newest series is Piper Green and the Fairy Tree.